What a wonderful surprise you turned out to be. So loyal to your Mom when she was in bed. Enjoy your walks and free time. Hi Suma! Happy Dog of the Day! What a beautiful blend of Dobie and Pointer you are, Suna!!! Your sleek, chocolate brown coat is gorgeous, and what I wouldn't give to stroke those long, velvety ears! What a priceless treasure your mommy was blessed with upon her return from overseas, after serving our country so selflessly! (Thank you daddy!!!) It definitely was a case of love at first sight, and after the name change, hehe, the deal was sealed, her dream doggie come true in you! How lucky your mommy is, having an active and athletic, loyal and loving best friend, devoted nurse, full fledged furry family member in you, Suma! And equally blessed are you, living every adventure loving pup's dream life, what with an acre of land to call your own, enjoying all of those fun outings and activities, including but not limited to: bicycle trips and swimming excursions, chasing all of those frisky critters, taking long walks, being spoiled rotten! What a team you and your mommy make, best friends for life!!! Thanks for the BIG smiles, Suna! Meeting you today, seeing all your gorgeous photos, has been a real treat! Hope you're enjoying a very special, action packed, fun filled Dog of the Day...biking and swimming, hiking and "hunting," being loved and pampered to pieces by your proud pawrents! 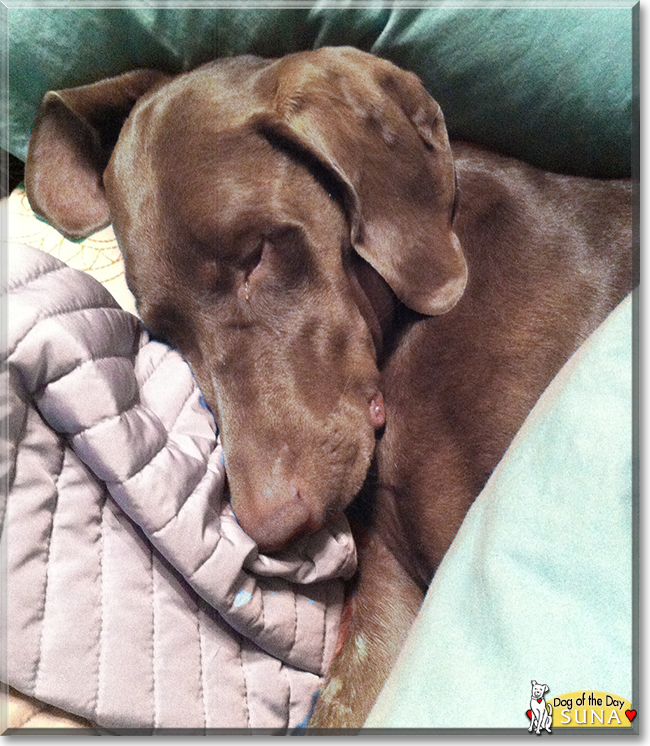 Lots of love, hugs and kisses to you, beautiful, sweet Suma, our very special and most deserving Dog of the Day, EVERY day! And again, heartfelt thanks to your mom for her service! Suna is a beauty! Thanks so much for your service. I am so happy you have Suna now and forever, what a healthy active life you all lead. It is sweet that Suna knew when you needed her, were ill, and did everything she could to care for her Mum. What a glorious and very special DOTD! Sounds like you all are a very loving and passionate family, all of you deserve the best! Suna is awsome!! 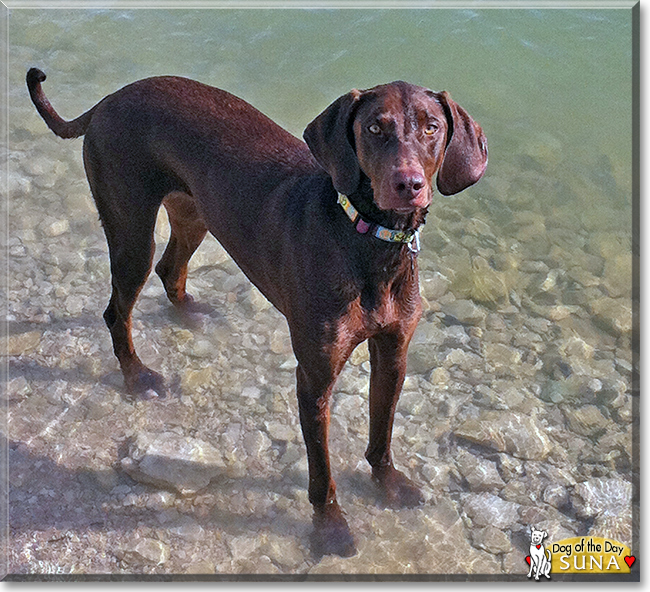 Congratulations on being Dog of the Day, Sweet Suna!